Forbes’s Robert Lenzner Gives Creative Capital 5 Stars!!! Lenzner describes Doriot as one of the true blue gents of finance, a throwback character who “stood above all for principle in business and was not a money grubber.” In the column, he also compares and contrasts Doriot to another gent, Ronald Cohen, the founder of Apax Partners. Doriot WAS larger than life and his ideas were just as radical and important as Drucker’s but Doriot was not a self-promoter. 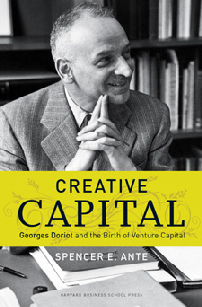 While writing the book, I often wondered why Doriot was not as famous as Drucker. There is a certain formula of fame, I concluded. Obviously, I wrote this book partly to help revive and restore Doriot’s reputation. So it feels good to see that readers are giving Doriot his due with reviews like this one and others.